The RMHF Says Learn, Volunteer, and Enjoy! This article first appeared in the Rushville Republican on May 16, 2017. One of the many jobs of the Rush Memorial Hospital Foundation is to coordinate volunteers from the community for Rush Memorial Hospital. There are two specific ways that any community member may give of their time and talents to Rush Memorial Hospital. First, you can apply to become an RMH volunteer. Information and the application can be found at www.rushmemorialhospitalfoundation.com. Click on Ways to Give, then Volunteer to access the downloadable application. This simple application can also be picked up at the RMH Foundation Office located at 1230 North Main Street, Rushville. Volunteers from age 18 and up can be placed in many locations within the hospital campus. Areas may include Admissions Desk, Medical Office Building volunteer desk, 13th Street volunteer desk, or specific departments that have asked for a volunteer. Volunteer skills and abilities are matched so that the experience is best for all. Clem Davis, longtime RMH volunteer who will soon be celebrating her 90th birthday says, “I love volunteering and I couldn’t live without it. It’s what keeps me going and keeps me active and social. I love helping the guests that come into the hospital.” The RMH Foundation is looking for outgoing, people-centered, volunteers that enjoy giving back. If you have one hour, one morning or afternoon, or an entire day, we have a place for you. There are perks available for volunteering too. Please consider this opportunity. We are looking for some great people! Second, you can join the RMH Foundation Seed Circle. The RMHF Seed Circle began in 2012 as the brain child of RMHF Director Faith Mock. She states, “The hospital did not have any existing auxiliary at the time. I wanted to get local women together to learn about the amazing services within the hospital and to support the RMH Foundation. I’m so grateful that the RMHF Board of Directors supported this idea. What a fantastic group of ladies. We are always looking to add to this group. It is fun, educational, and you have a way to give back to your community’s health through supporting Rush Memorial Hospital. It doesn’t take a large donation or amount of time. The members decide how they can best give back.” This group is comprised of Rush County ladies that wish to learn more about Rush Memorial Hospital and the RMH Foundation. Meetings are bi-monthly at 6:30pm. Each meeting consists of a program from the hospital staff or a tour of a specific hospital department. This is a great way to learn firsthand what is happening at RMH. These ladies also learn about funds, projects, and events that are occurring at the RMH Foundation. Being the first in the know allows them an opportunity to volunteer to help with projects such as Bella, Teddy Bear Clinic, and Brian’s Cause. 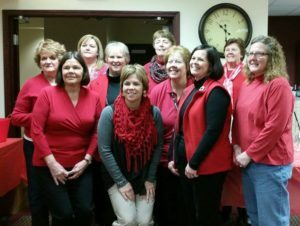 This group is the sponsor of the annual “Show Us Your Red for Heart Health” in February. It is a great way to get connected with the health of the community and how the RMH Foundation supports Rush Memorial Hospital in its vision and mission. Members are asked to make a donation of any amount, once each year, to any fund within the RMH Foundation. Volunteering is encouraged, but not mandatory. This group has developed a great fellowship and they have so much fun. The next meeting of the RMHF Seed Circle is Thursday, May 18, at 6:30pm in the RMH Foundation Office at 1230 North Main Street, Rushville. Come and check out this active and wonderful organization. The program will be given by the RMH Emergency Room nurses. For additional information about either of these volunteer opportunities contact the RMH Foundation Office at 765-932-7568.